Focus more on your patient care when you rely on Medical Data Services, a medical billing company in Winston Salem, North Carolina. Medical Data Services can offer a custom program to efficiently handle all of your medical billing needs so you don't have to worry about computers, software, and personnel. 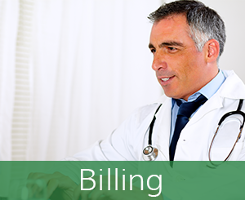 Let Medical Data Services in Winston Salem, North Carolina, handle all of your medical billing needs. Our company was founded by Wooten Peebles in 1995 with the intent of providing professional medical billing assistance to medical providers. The fact that we've had clients that have been with us for two decades is a testament to our quality service. Our customers have said we provide excellent services that allow them to concentrate on providing more professional care to their patients. Thank you for your interest. For questions or comments, please use the information listed here. Please be sure to include your name, email, phone, and a specific question. You will receive a confirmation after submitting the form, and we will respond as quick as possible to your satisfaction.